While dressers used to be one of my top furniture pieces to paint, they have been kind of scarce in the last several months. So, when I found this one while out furniture shopping I was super excited. It was in structurally fantastic condition and just needed a little cosmetic work. And the details are gorgeous. Look at those carved feet! I finished this piece with wax for a true, hand finished vintage feel. Great piece and I do love that red. Beatiful Angela! Terrific shade of red! Gorgeous! 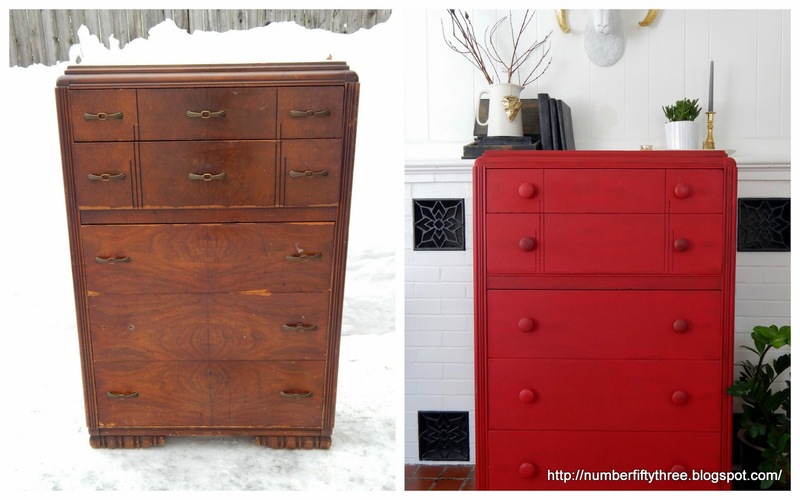 I'm dying to try a red dresser - do you keep yours or do you sell them after posting? My only worry is that it won't coordinate with anything in my house and I won't be able to sell it when it's finished.... but yours is SO fantastic! Found you through Between Naps on the Porch - thanks for sharing! I love the pop of red Angela! And the new knobs really give it a fresh new feel too! ... Featured you at our party this morning. Thanks so much for sharing! That is a stunning shade of red. I love it!